The thing about shopping for a sailboat on the internet is that you cannot actually see the sailboat. Sure, you read all the specifications, review the inventory lists, look through hundreds of photos…then make a spreadsheet to actually review this data back to back because you’re looking at so many sailboats that you don’t know which one is which. But you cannot actually see the sailboat; cannot actually tap on the hull, sit in the cockpit, inspect the deck, open the bilges, crawl into the engine space, feel the sailboat, smell the sailboat (because let’s face it oftentimes used sailboats smell funky). Shopping for a sailboat on the internet is a teaser; it gets you thinking, gets you prepared, and gets you salivating because there are so…many…amazing…sailboats! And then, it’s time to SEE the sailboat! After narrowing our criteria, Brian, Bruce, and I had compiled a list of potential boats. We’d had the specs memorized and the photos imprinted on our brains. We were ready to make one of these prospective boats our own! But first…how exactly do we get out of Panama!?! Travel by land was an astounding idea to Brian and I. What would we pack? How would we transport ourselves from place to place without a dinghy? Where would we sleep at night without our home anchored nearby? 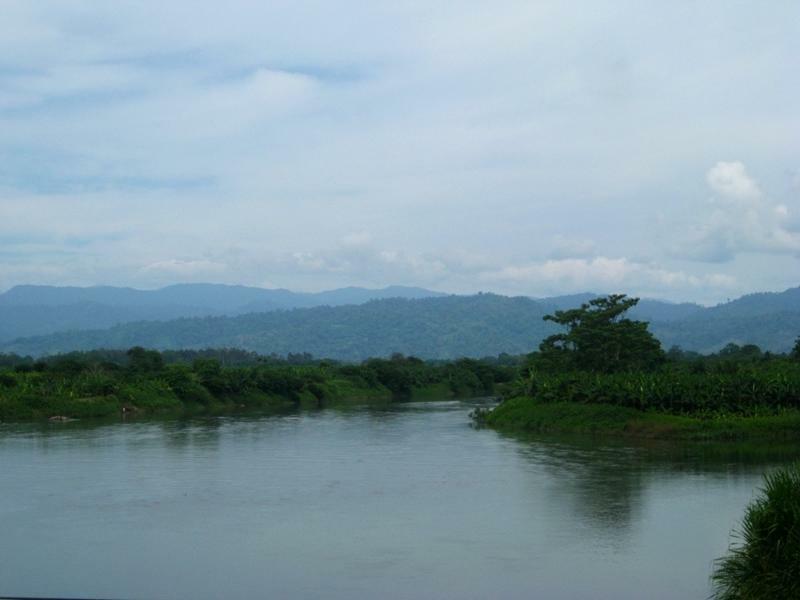 We rode approximately 30 minutes in the van from Almirante, Panama to the town of Changuinola, Panama. We were squeezed into the backseat of the van with a fabulous couple, Courtney and Tim from Seattle, WA. We chatted excitedly with Courtney and Tim about our travels and theirs; the time quickly passed and soon we’d arrived at Changuinola, the next transfer location. The pick-up truck carrying our luggage was parked across the street, thank goodness, and the driver repeated, “San Jose! San Jose” as we hopped out of the van. Brian grabbed our two backpacks from the pick-up truck as we were shuffled into a coach bus. We noted that the other passengers were also wearing green, SAN JOSE bracelets. Prior to the bus departure from Changuinola, the driver had us sign a passenger list and he provided us with immigration paperwork. This bus would take us across the Panama/Costa Rica border. Here we go! 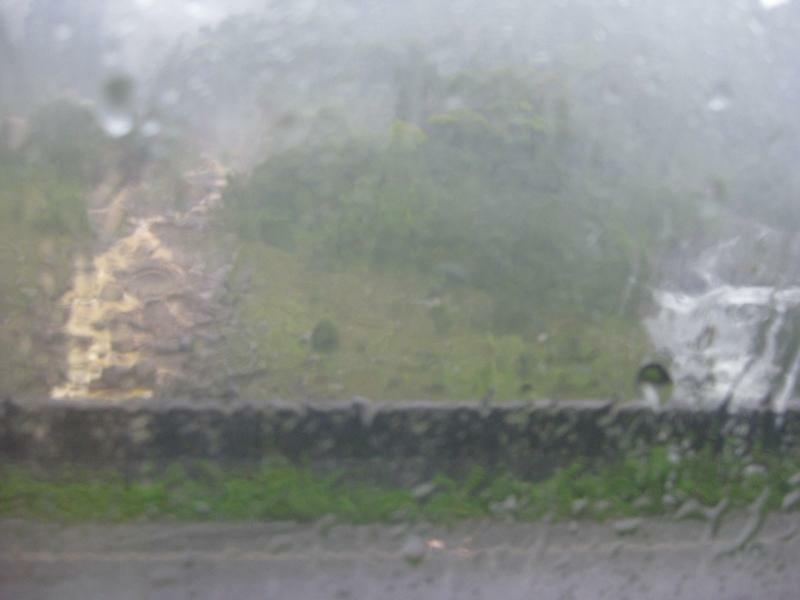 We marveled at the speed at which we were moving as we watched the scenery pass by through the bus windows. We passed miles and miles of banana fields, even stopping once for the bananas to cross the street! Seriously! Each of the clumps of bananas on the trees were covered with a blue plastic bag. When the bananas were cut, they were conveniently already bagged, and the bagged clumps of bananas were hung on a manual conveyer belt to be moved from the field into the packaging area. One of the banana conveyor belts crossed the road; stop signs and barriers came down as if we’d stopped at a train crossing, and a man pulling the manual conveyor belt walked across the street and onward to the packaging area pulling a clump of bananas. While the bus was stopped, over two dozen clumps of bananas were conveyed across the street. Amazing! I’ve waited for cattle crossings and goat crossings but never bananas! 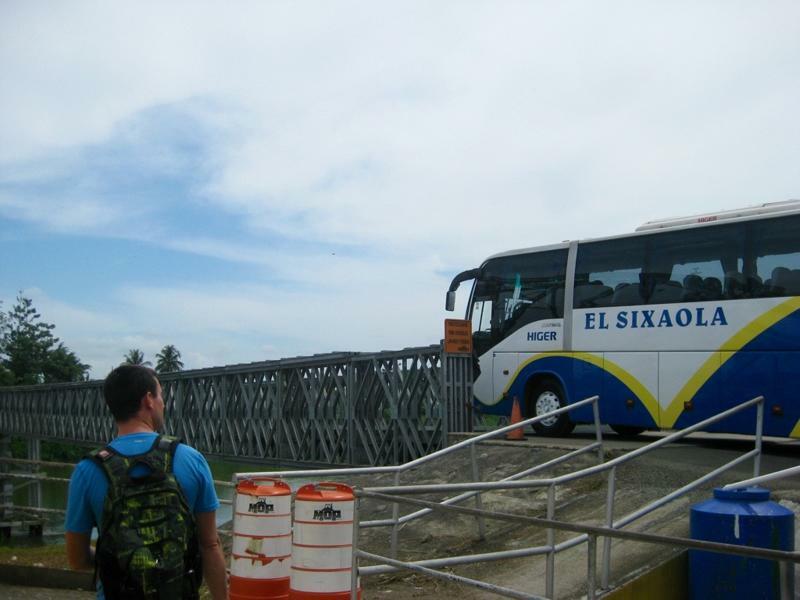 At the border of Panama and Costa Rica the bus stopped. We were instructed (in Spanish, so much of our action was purely mimicking the other passengers) to take our immigration paperwork and exit the bus. Our friends, Steve, Di, and Shera had fortunately prepared us for this portion of the trip. We exited the bus with our immigration paperwork and our belongings, after all we were only carrying a backpack each. 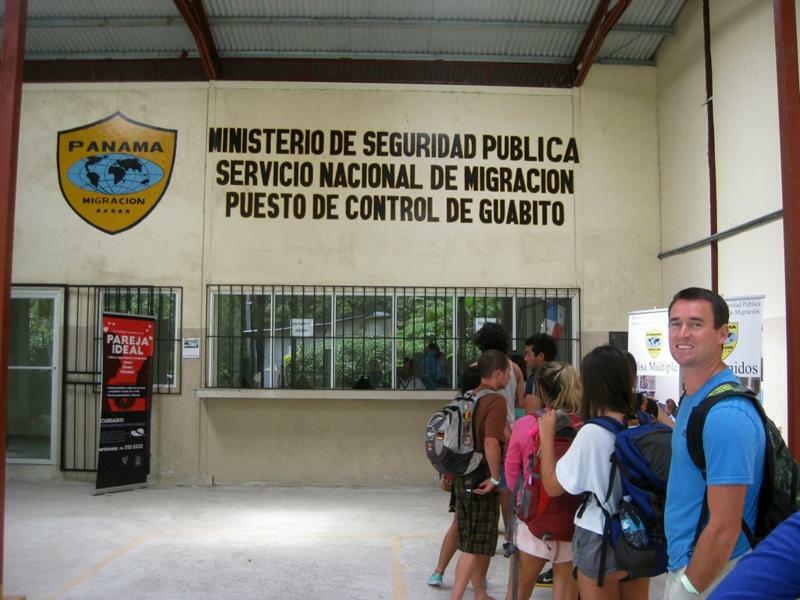 We walked to the Panama Immigration window to clear out of the country. We really hoped we were doing the right thing by traveling because upon our arrival by sea we’d obtained a 1-year Visa which we would now void by leaving the country. But opportunity lay ahead! Now cleared out of Panama, we walked across the street and up the hill, following recognizable bus passengers and occasionally being directed by the bus driver. 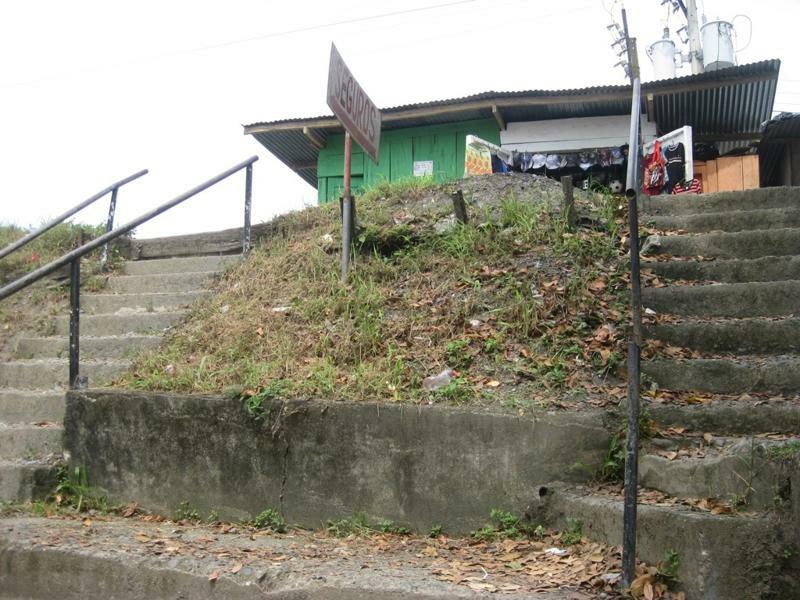 At the top of the hill, we entered yet another Panama immigration office; this one local for the Bocas del Toro District. The stop into this office cost us a grand total of $4.00 and we obtained a sticker indicating that we’d cleared out of the District. 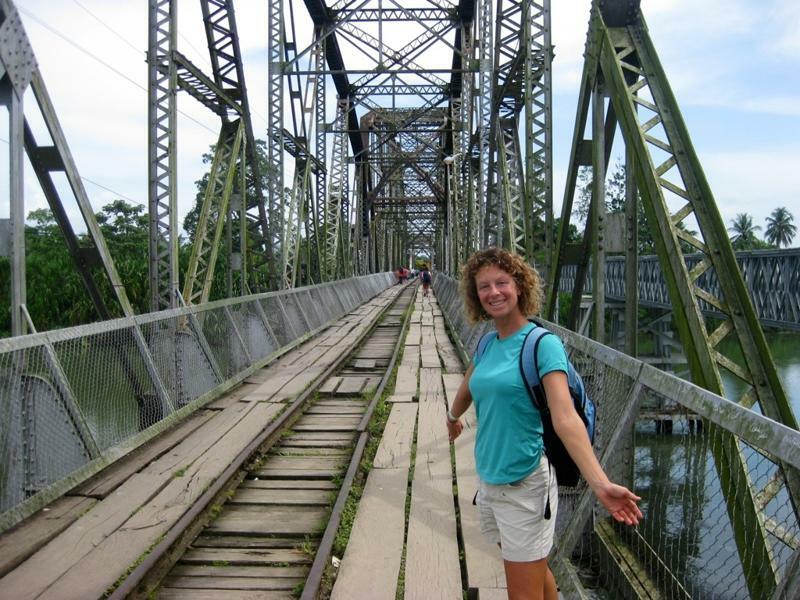 …we walked across a rickety, old railroad bridge and entered Costa Rica. The immigration office stamped our passports and we boarded the bus once again to continue the drive to San Jose. The bus wove its way up steep, narrow roads. Thick jungle lined the roadside banks and waterfalls cascaded down from above. Fast moving tractor-trailor trucks whizzed by within inches of the coach bus. Rain poured down during intermittent thunderstorms. We were stopped for nearly an hour and one-half due to an accident; and the bus wasted no time once we were moving again! We arrived at San Jose late in the afternoon at the “Coca Cola” bus stop, one that travel guides had warned us about visiting due to crime. Fantastic! No sooner had we stepped off the bus than taxi drivers had attached themselves to us like velcro. “Taxi! Where you go?” The taxi driver was pushy, and snatched Brian’s luggage tag from his hand so that he could step forward and claim our bags. Brian was on guard, “No thank you,” he said as he reached for our bags himself. Brian haggled with the persistent taxi driver until they reached a price that the driver said he could go no lower than. We took the taxi from the bus stop to Maleku Hostel where we’d made a reservation. This taxi ride was CRAZY!!! It was rush hour in San Jose. Our driver was weaving in and out of traffic. I’m certain he did not stop at a single stop sign or red light, he merely honked the horn as he continued through intersections and merged into traffic. There were moments when I didn’t think we’d survive this taxi! I’d never been so happy to step onto solid land as when we’d arrived at Maleku Hostel and exited the taxi! Maleku Hostel was clean, secured, and comfortable. We settled our belongings and took a walk just around the corner to a fabulous Italian restaurant for dinner followed by a stop at the grocery store to pick up food for cooking our own breakfast. What a day! Water taxis, a van, a coach bus, a taxi…so this was land travel! I settled into my bunk-room bed for the night wishing that home had been just a dinghy ride away. 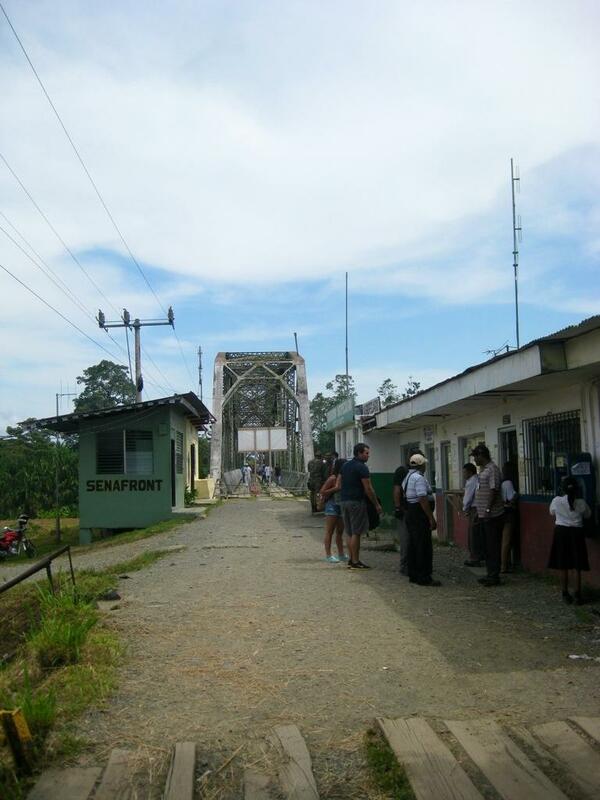 This entry was posted in Uncategorized and tagged banana conveyor, bananas, bocas, bocas del toro, bocas to San Jose, coach bus, Costa Rica, maleku hostel, panama, puerto viejo, San Jose, San Jose Costa Rica, water taxi, yachtworld by stephanie. Bookmark the permalink. Wow! Good to know, glad we booked a driver for our trip for San Jose to Jaco! Would have been cool if you timed this so we could have seen you in San Jose, alas I know the blog is a week or two behind :). Our 1987 Cabo Rico is in Ft. Pierce, FL and waiting for a new owner! She has new rigging and canvas with enclosure, and is in terrific condition. Good blue water cruiser and listed with Curtis Stokes! Lets make a deal!! !